A web project plan tends to be a much more fluid instrument than you would find on other projects. This is because scope is often uncertain, timeframes tight and resources are matrix managed. All of which means a web project plan constantly changes either due to updates or re-plans. For example I know of one internet project which has gone through 6 re-plans before even reaching the development stage! As a result most web project's are developed using an Agile approach. 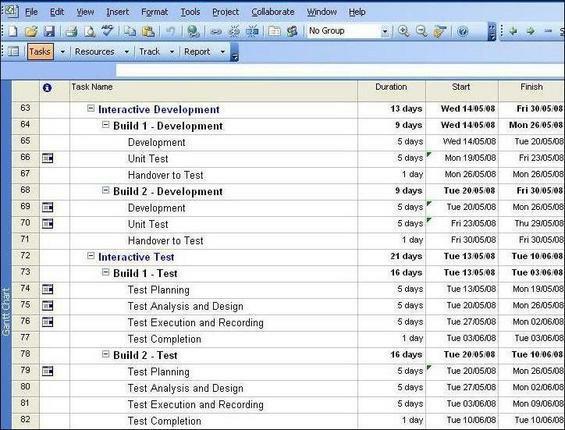 This means your plan will contain a number of overlapping phases such as short development cycles often overlapping with testing phases as demonstrated in the example below. Now you're probably thinking, "where's the project contingency?". The bad news is that on web or E Commerce projects there tends to be no contingency other than weekends being worked. This means that should one phase slip it tends to result in a day on day slippage for the entire launch date! Therefore whilst you may know how to write a project plan, when it comes to the web projects you need to be even more creative, especially since project stakeholders have a nasty habit of suddenly requiring you to deliver to even tighter deadlines than oiginally stated. For example my project was in system testing when the project stakeholders decided we had to bring in the next milestone to de-risk the press launch. This mean't reducing a 6 week phase by 10 days when we had already started it! Needless to say we all had to work long days and all the weekends to hit the new deadline. Remember if you over complicate the plan you and you alone will have to update it each time a re-plan is required. Ensure that each phase does not completely overlap another. So for example development cannot start as soon as requirements gathering starts. Never try to slash testing time. This is often the stage where the project slips. It is better to start testing as soon as possible so you know how big a problem you are looking at. Make sure you get Project Stakeholders to make firm decisions on key functionality before starting development, otherwise with an Agile approach you will find your development phase never-ending. 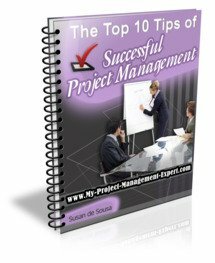 You project initiation document or project charter is a good place to finalise this. Never under-estimate the amount of time required by Creative to get the GUI (Graphical User Interface) designed and more importantly approved by project stakeholders.